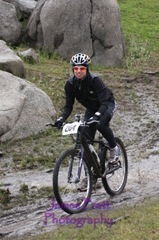 This is going to be my 2nd off-road triathlon. It’s cool because it’s in our backyard and it starts later (10am)…nice! I’m feeling much more confident on the bike than last time. 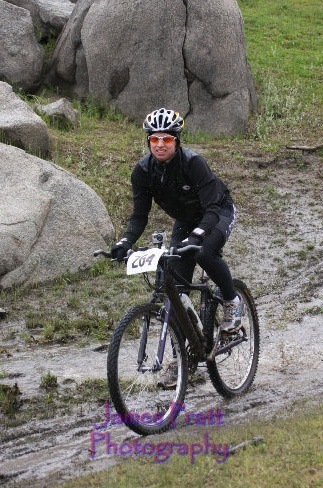 Yesterday, Troy dragged me down to ride the course in the cold rain and wind and I’m so glad he did! It helped mentally knowing what to expect. 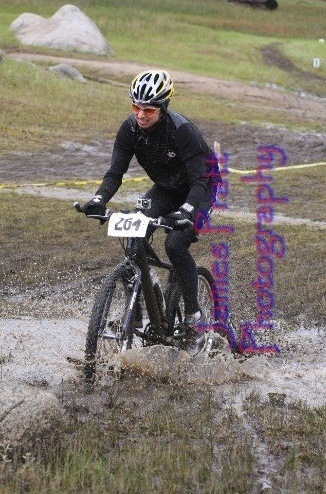 It’s going to be really muddy, wet and sandy out there…and I’m kind of looking forward to the bike this time! What I’m not looking forward to is swimming in 48 degree water! Troy’s suffering in cold conditions has taught us how to layer up for this type of swim. I’ve got my rash guard under my jersey, my wetsuit of course, neoprene cap under my race cap and booties…and after I get out of the water, I’ll put on my jacket, long-fingered gloves, leg warmers and socks. Okay, so I’m not going for any time records here…I’m going for comfort today! It helps that the sun is peeking through a bit! 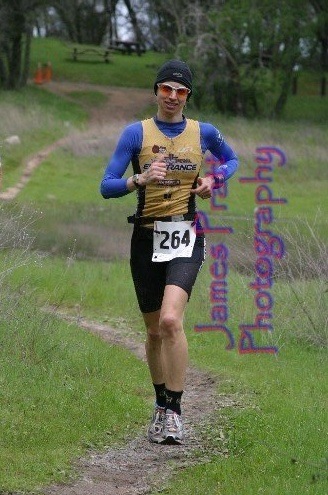 The girls and I head out for the race and pass Troy as he runs down to Granite Bay to meet us. Once we get there, they help me get my transition area ready. They are such good little helpers and they are being really good…thanks God for a smooth morning! Troy shows up and then I’m off to soak in the lake! The water is super cold at 48 degrees! I am so glad to have on booties and Troy’s neoprene cap! I take our friend, Jeff Landauer's, advice and put my hands in the water and let them go numb. I try to splash my face to get it used to the water too. I opt out of a warm-up swim and hope I’ll survive. Okay, time to go…ready, set, go! I jump in and immediately my goggles fill up with water. I stand up and notice that the seal has come off one side. It takes about a minute to fix it and by then, most of the field is gone! I jump in again and get a big shock. Wow, that is COLD on my face! I stop again and gasp for air…”Oh Lord, help me!” I cannot quit now, I’ve got to just keep going! I start again and finally after a few minutes my face goes numb and I get into a good rhythm. This is definitely the slowest swim I’ve had in years but I don’t let that discourage me…this is just a fun day! As I get out of the water, I strip off my wetsuit and hand it off to Troy. I tell him what happened as I run up the beach to T1. I give the girls high 5’s on my way up. Once I get to my bike, I start putting on the layers. It’s overcast and a bit chilly today so I want to be comfortable out there. I realize that I’m getting farther behind in the rankings but it’s worth the delay. Off I go! I start out on the bike with Troy’s bike camera on the handlebars. I hope to get some good footage before the batteries die! I have 2 x 8mile laps to complete. The first mile is rough as I just try to get into a rhythm and lots of guys are passing me. I pass by friend Dave Campbell who is directing traffic. Once on the first climb, I’m feeling better and slowly my confidence comes back. There are so many mud puddles, water and sand out here! It’s scary and fun at the same time. I pass by a guy lying on the ground with a bloody nose. There is a racer that has stopped with him…Lord, please help him! On the backside of the course it’s like I’m in Ireland…beautiful! I love it! I get to a really mucky section that I got stuck in in practice. I decide it’s better to run through it. Soon a girl passes me and she looks like she’s in my age group. I work to keep her in sight. We are flying through a nice down section…what fun! I come through the first lap just behind the girl and see my wonderful family. Troy tells me I’m in 15th and to try to make top 10 on the next lap. They cheer me on and I’m pumped up for the next loop. 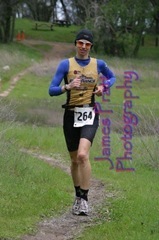 I continue to chase that girl and feel like I’m already going faster this 2nd loop. I pass Dave again and again start to climb. 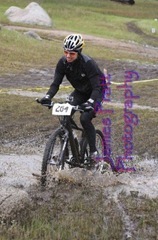 I’m having more fun and I’m being more daring this time…going over rocks, over roots and splashing through puddles. I still have that girl in sight as I go through Ireland again. Soon I notice my brakes are not working as good. I cannot control my speed on those curvy down sections. Then, I have no brakes! I pull off to get out of people’s way and cannot stop. I run into a small grove of small trees. A guys says “are you alright?” “Yeah, I have no brakes”. This is a real bummer because I’m at least 3 miles from T2. Lord, what do I do? Should I quit? No! Keep going and persevere! This is going to slow me down but I cannot worry about that now. I ride the uphills and run down the downhills. I also try dragging my left foot to slow down. This is risky! I remember that Troy broke his foot when it got stuck on a root years ago. Please Lord, protect me! I start to listen to the negative voice in my head. “You are going to be so slow! What will (Pro) Jamie Whitmore think of this stinky performance? Top ten, what a joke! You are going to look so silly!” I start getting frustrated and I’m on the brink of tears. I start to pray again and ask the Lord for His courage. He gets me through and eventually T2 is near! I see Troy and the girls. I tell Troy what happened and he tells me to focus on the run. Okay, this is my chance to catch some girls! I strip off most of my muddy gear and head out. I feel pretty tired but I welcome the change of pace and fewer puddles on this trail. Only 3.5miles left now! Mile 1 is 7:43. Not as fast as I expected but at least I’ve been able to pass a woman and a few guys. I just need to keep up the effort! The trail undulates up and down as does my pace. Soon, I hit some sand and focus on good form. There are a bunch of guys just ahead of me and I’m motivated to chase them down. Mile 2 is 8:34. As I hit the steep climb, I start to pass those guys. Just keep running! Little by little I pass some and catch up to a few others. At the top, there is one more guy ahead and I stick with him. He’s picked it up and I am determined to stay with him. Mile 3 is 8:39. I see a girl ahead and pass her. “Good job!” and she says the same. I continue to chase the guy as we both continue to pass others. Home stretch is coming! I know that Anna is waiting to finish with me. I’m pretty tired but give it what I have. The guy pulls away but I’m not discouraged. As I look ahead, there’s Anna! I grab her hand and we go! “Come on Anna, let’s go for it!” We race to the finish and cross together. Thank you Lord! I stop and hug Anna and thank her for the company. It’s sunny and I’m done! It was a tough but good day! I think I’ll keep trying this mtn. bike thing after all! The Bike: Check out these pictures for some crazy crashes! Click here!